I love that Hamilton’s City Hall has an edible garden. Purple cabbage, kale, parsley, and Swiss chard fill the garden beds out front of the shiny new refurbished City Hall. After passing the cabbage patch out front of Hamilton’s City Hall, I biked past a small splatter of chalk messages to the late Jack Layton on the sidewalk. It was a very sweet tribute to Jack from local Hamiltonians. Still, nothing can compare to the overwhelming and touching response to the recent passing of NDP leader Jack Layton in front of City Hall in Toronto. 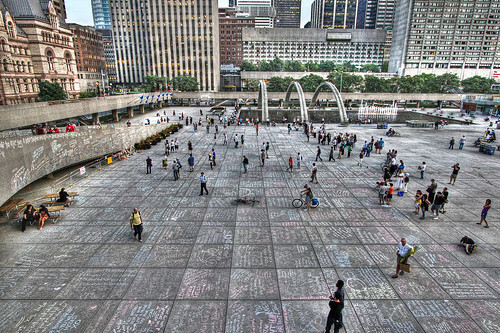 Crowds gather in front of Toronto City Hall, Nathan Philips Square, to read chalk drawn messages dedicated to Jack Layton.